This should have been a Singapore GP weekend in which Ferrari's Sebastian Vettel cut the points deficit to Lewis Hamilton from 30 to 23. This should have been a Singapore GP weekend in which Ferrari's Sebastian Vettel cut the points deficit to Lewis Hamilton from 30 to 23. Instead Hamilton had an inspired weekend and Ferrari was found wanting on pace and strategy as the gap opened to a potentially insurmountable 40 points with six rounds to go. After a pole position lap he describe as "the closest to perfect I have ever done", Hamilton controlled the race and took his seventh victory of the year, while Red Bull's Max Verstappen did him a favour by demoting Vettel to third place. Despite Ferrari having the best car for much of this season and Hamilton saying that the Singapore circuit would definitely be a Ferrari track, Mercedes has chipped away at its relative weakness in traction out of low speed corners and had surprising pace all weekend. Hamilton's fourth career victory at the Marina Bay Street Circuit, also benefitted from Ferrari choosing the incorrect tyre strategy for Vettel. After jumping Verstappen at the start, Vettel initially looked to be in the fight, but the Ferrari man lost out to the Dutchman over the pit stop phase, being the first to stop and selecting ultra soft tyres. With no option to stop again without losing track positions, he was forced to nurse his tyres to the end of the race, settling for third place. 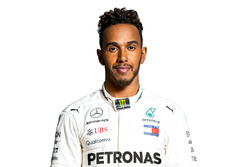 Hamilton's 69th Formula One victory - and his 44th from pole - means he now holds a firm grip on the drivers' championship. "I think overall we were not fast enough. We didn't have the pace in the race, but also I think we tried to be aggressive in the beginning. Obviously it didn't work out," said a disappointed Vettel. "After that, I think I had a different race to the other guys, on a different tyre. I wasn't very convinced that we could make it to the end, but pitting was not an option because you would lose to much time in the pit stop, so we just focused on making it home. "With the way we raced, we didn't have a chance. There may be something extra in the fact that we were not quick enough...I think I said before the weekend that we can only beat ourselves, and I think this weekend we didn't get everything out of our package." Valtteri Bottas fended off late pressure from the second Ferrari of Kimi Raikkonen and Red Bull's Daniel Ricciardo, whilst Fernando Alonso took McLaren's best result since the Azerbaijan Grand Prix by taking seventh ahead of compatriot Carlos Sainz and Sauber's Charles Leclerc, who all benefited from a combative race in the midfield. Any threat of Hamilton coming under attack from a Red Bull with nothing to lose was denied by a poor start for Verstappen, which immediately put him under pressure from a fast-starting Vettel. With the Ferrari having to make a move around the outside of turn one, the Red Bull initially held the place, but a better drive - and a slipstream - out of turn four allowed Vettel to power into second place, moments before the safety car was deployed for a collision between the two Force Indias. Bottas held fourth ahead of Raikkonen and Ricciardo. Sergio Perez managed to hold onto seventh in the opening corners, but team-mate Esteban Ocon was challenging around the outside of turn three. However, the two came together and Ocon went into the barrier. No other cars were collected, but Williams' Sergey Sirotkin was forced to pit after collecting part of the Force India's wheel rim in his front wing. With Hamilton managing to sufficiently break away from Vettel after the safety car, the top three were covered by around two seconds as those on the hypersoft looked to preserve their tyres for as long as possible. After the leaders had developed enough of a gap to the ultrasoft runners (led by Alonso in ninth), Vettel was the first man to get rid of the hypersoft tyres for a set of ultrasofts. He initially managed to return to the track in clear air, but he quickly caught up to Perez, who was extending his opening stint on the hypersofts. The delay for Vettel allowed Hamilton to pit for soft tyres pressure-free. It was a full lap before Vettel could clear Perez, which allowed Verstappen to make his pit stop, rejoin side-by-side with the Ferrari, take the inside line into turn three and marginally take the place from Vettel. To make matters worse, Vettel was already reporting to his team that he didn't believe the ultrasoft tyres could make it to the end of the race. Almost in response to that information, Ferrari gave Raikkonen a set of soft tyres when the Finn pitted almost ten laps later than Vettel. Meanwhile, Red Bull further extended Ricciardo's hypersoft stint and kept him on track until the end of lap 27, putting him on the ultrasoft tyres, hoping that they could get the Australian to the end of the race on an aggressive one-stop strategy. Further down the order, the midfielders who started on the hypersoft tyres were being hampered by Sirotkin. After making their stops, the likes of Perez, Hulkenberg and Grosjean were being held up by the Williams, which had already pitted for soft tyres during the early safety car phase. This was allowing the drivers who started on the ultrasoft tyre an opportunity to stay out and gain track position. At the head of the queue behind Sirotkin, Perez eventually lost his cool. Making a move on the inside of turn sixteen, Sirotkin fought back and the pair were side-by-side going through turn seventeen. However, Perez moved across to defend his position far to early and clattered into the side of Sirotkin, giving himself a puncture and damaging both cars, earning himself a drive-through penalty. Sirotkin lost a further place to Hulkenberg, but was able to continue and defend against the faster cars. The new train of cars eventually fell back towards being lapped by the leaders, and a battling Sirotkin and Grosjean backed up Hamilton into Verstappen. The Red Bull driver was right on the tail of Hamilton as the Briton gingerly negotiated the traffic, but a brief hold-up behind Grosjean prevented him from keeping with the Mercedes. The Haas driver earned himself a time penalty for ignoring blue flags. Profiting from the battling lower down the order, McLaren's Fernando Alonso and Renault's Carlos Sainz pitted for soft tyres to take a net seventh and eighth place, gaining four places from their start positions. Further ahead, Hamilton managed to extend his lead to around four seconds over Verstappen, whilst Vettel had dropped to being ten seconds off the pace of Verstappen, and looked to be turning down the power unit and accepting defeat. The battle for fourth place was starting to close up. Raikkonen had gradually reeled in Bottas and Ricciardo (the only one of the three on the ultrasoft tyres) had caught them both up, setting lap records in the process. With Bottas complaining that he was being hampered by the distant backmarker of Hulkenberg, Raikkonen was able to get within the DRS zone and apply pressure to the Mercedes driver, however the Ferrari man didn't have the pace advantage to capitalise. Back at the front, the pressure eased on Hamilton and the Mercedes man was unchallenged as he crossed the line to take the Singapore win ahead of Verstappen - who took his first podium finish around the Marina Bay Circuit - and Vettel, who had long since turned his car down to save it for another day. Bottas held on for fourth ahead of Raikkonen and Ricciardo, whilst Alonso was the only midfielder to finish on the lead lap. Sainz took eighth ahead of Leclerc and Hulkenberg, who was the only midfielder to start on the hypersoft and take a points finish. Way down the order, a late hypersoft stint for Haas' Kevin Magnussen gave the Dane his first fastest lap accolade of his career. Who was your driver of the day in Singapore? Leave your thoughts in the comments section below.